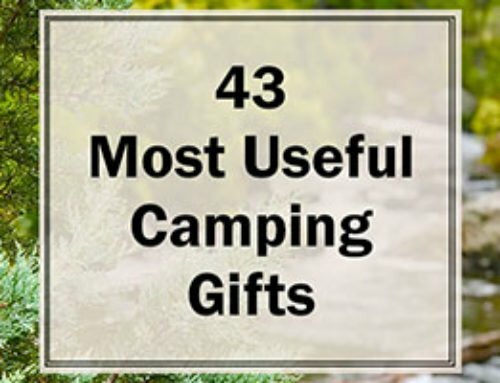 Camping as a family can be a lot of fun but it can also be a lot of work. These 33 family camping hacks will help you make camping easier and more enjoyable. Glow sticks are a great way to provide a little light in your tent that isn’t too bright for sleeping. Just hang one or two in your tent and you will have just enough light to see if you need to get up in the middle of the night. Rain happens and you want to make sure your tent doesn’t flood. A great way to make sure rain doesn’t flow into your tent is to dig a small trench around your tent will an outlet headed downhill. 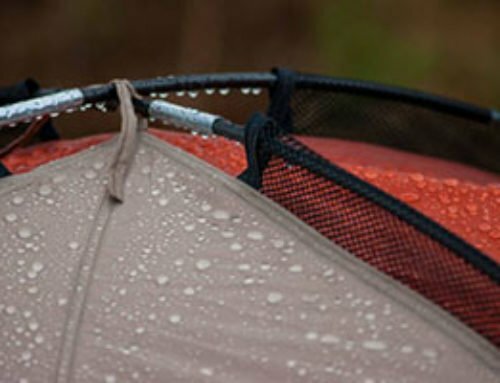 This will ensure that if it does rain during your camping trip, your tent won’t be flooded. It’s a good idea to place dry firewood under your car so that if it rains it will remain dry. Additionally, to be extra safe you can also dig a small trench around your car to prevent water running under your car and getting the wood wet. When camping in warm weather, heat can be a real problem. Using a couple tent fans in your tent can make a real difference and make sleeping a lot more pleasant. You can find lots of great tent fan options on Amazon for really great prices. When camping in cold weather it really helps to have a small heater going in your tent when you are going to bed and waking up. This makes it really easy to get kids changed and in or out their sleeping bags. Mr. Heater is probably the most popular option but there are a bunch of options you can choose from on Amazon. If you have access to electricity then it is super easy to use any small space heater. If you don’t have access to electricity then you can use a propane header like Mr. Heater Buddy. I don’t sleep with the heater running because propane heaters can produce carbon monoxide but I run it a little before we go to bed and right as we are waking up. Be cautious with propane heaters to avoid carbon monoxide. Make sure to have proper ventilation, use a carbon monoxide detector and I wouldn’t recommend sleeping while the heater is running. 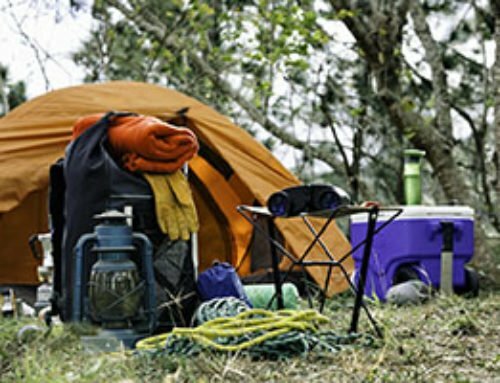 Having rock, pinecones, sticks, or other items under your tent can make tent camping less comfortable. Bring a rake and smooth out the location of where your tent will go. It will make things more comfortable when sleeping and when simply walking around the tent. You can create your own camp shower/washing station. Use a 2-gallon sprayer with kitchen sprayer attached. You can even paint it flat black to absorb solar heat. This is a lot cheaper than buying a real camping shower and makes it super easy to get kids clean after a long day of playing. A solar powered string of lights is a great way to light up your campsite or tent in the evening. You won’t have to worry about having access to electricity or bringing extra batteries. There a quite a few options to chose from on Amazon and you can get them in different lengths, depending on the area you are wanting to light. Dirt is always an issue when camping. If you want to try and cut down on the amount of dirt that ends up in your tent, bring a rug for botht he inside and outside of your tent. Simply wiping your feed before and after getting in your tent will help a lot to control the dust and dirt that ends up in your tent. Instead of buying a bag of ice to put in your cooler, freeze a gallon or two of water and place it in your cooler. It will last longer than a normal bag of ice, it won’t fill up your cooler with water, and once it melts you will then have a gallon of water to drink. No one likes tripping of the guy lines of the tent. Cut up a couple swimming pool noodles and place them over the guy lines. It will make them a lot easier to see and less likely to trip over. Having to deal with mosquitoes and other insects is never fun. Make sure you bring enough bug and insect repellent for your entire trip. Additionally, it’s not a bad idea to bring a few insect traps for inside your tent and around your campsite. One great campsite option is the Thermacell Patio Shield. This will give you a mosquito-free area, which is awesome for an eating area or a general gathering area. Nothing is less fun than dealing with kids who have a sunburn. While camping, kids will be out in the sun most of the day. Using sunblock throughout the day will prevent sunburns and eliminate the complaining that comes from kids when they have a sunburn. If you get the spray on sunblock it is super easy to apply and only takes a couple minutes. Bubbles are a great way to entertain younger kids. They can spend a long time blowing bubbles and chasing them. If you have slightly older children, you can try a larger bubble maker as older kids tend to have more fun with them. For younger children, toddlers, and babies us a screened in canopy as a play area. This will keep them from wandering off as well as keep the insects away. Additionally, it makes for a great bug-free eating area when the kids are not playing in them. You can find lots of affordable option on Amazon. Extra blankets often come in handy. Whether it is cold and the kids need an extra layer to stay warm or you want to lay out a blanket for a picnic, we always find a use for extra blankets. Baby wipes aren’t just for babies….they are for everything. Seriously, you will be surprised how useful they are and for how many things you end up using them for. 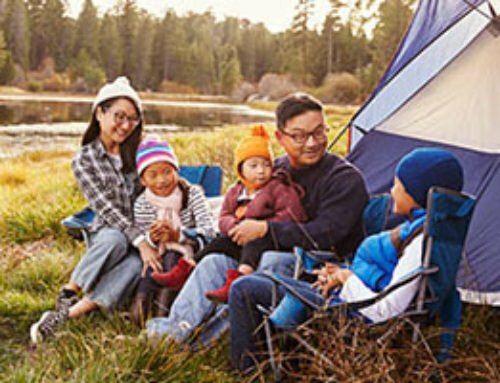 Things and kids get dirty when camping and baby wipes will help you manage that dirt and keep things and kids at least moderately clean. If you will be camping in a designated campground with roads, sidewalk chalk is a great item to bring with you. Kids love to draw and color. What better than to let them draw on the ground with chalk and spent time creating and using their imagination. Cooking from scratch while camping can be difficult. When possible, pre-cook as much food before your trip and heat it up at your campsite. There are a lot of great recipes that make cooking while camping a lot easier. Try a few out and find a few meals that work for you and cut down on the amount of cooking you have to do while camping. Having a handful of games to play as a family is a great way to mix up your day and add some additional fun on a camping trip. A couple board games or card games that your kids enjoy playing are a great option when the sun goes down and activities become more restricted. If you have young kids who are still potty training or still need to go to the bathroom frequently, a kids portable potty is a great item to have. The best use for it will come in the evening when getting ready for bed or in the middle of the night when your child just can’t hold it any longer. Having a small portable potty for #1 needs is a great way to prevent the need from trekking through the woods in the middle of the night to use the bathroom. I would definitely recommend that this potty be only used for #1 needs. With #2 needs, I’m sorry, you’re out of luck and will need to trek through the woods to the bathroom. You don’t want that smell in your tent. When things get wet, having dry socks and underwear will go a long way helping everyone feel more comfortable. Hopefully, you’ll stay dry but if it does end up raining and your gear gets wet, you’ll be grateful to have some dry socks and underwear for your self and your kids. Having a tarp over the top of your tent will help you in a couple different ways. If you are camping in warm weather, adding some shade directly over your tent will help to noticeably lower the temperature inside your tent. Additionally, if it does end up raining having that extra layer of protection will help to safeguard all your camping gear from getting wet. You can find lots of different sizes on Amazon, which allows you to get the best fit for your situation. 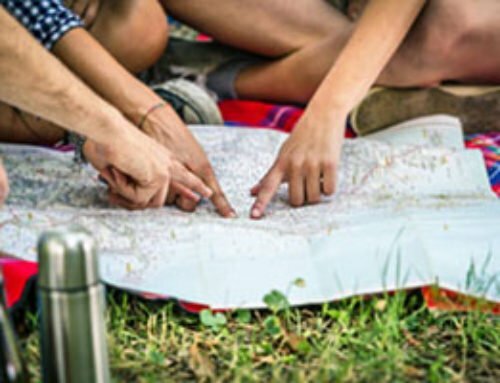 Start a camping checklist and make sure you keep it for your next camping trip. It is much easier to start with what you had on your last outing and add to or subtract from it. 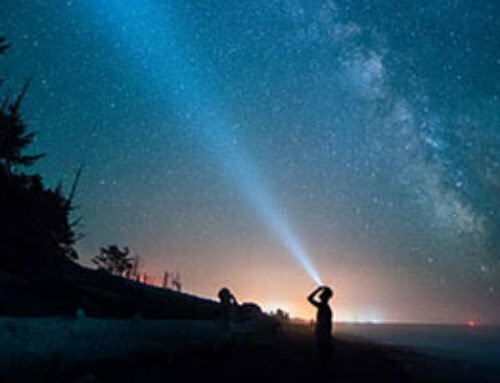 It will help you ensure you don’t forget anything and within a couple camping trips, you will have an ultimate camping checklist customized to you and your family. A super easy way to start a fire is to prepare some free firestarters from things you usually throw away. Save a few of the cardboard toilet paper rolls from used rolls and fill them with dryer lint from your dryer. These DIY firestarters light easy and are a great way to get your campfire going without having to search around for lots of kindling. Taking kids to the bathroom in the middle of the night is never easy but you can make it easier with solar powered stake lights. Use these stake light to create a path to the bathroom so that you don’t have to worry about finding a flashlight in the middle of the night. Additionally, these stake lights offer a great way to light your campsite at night. If you have younger kids, it is a great way to create a perimeter around your campsite and tell your kids they are not allowed to go past the lights when it is dark. No matter how much you try, when camping with the family, you are going to end up with a lot of dirt in your tent. Bring a small handheld broom and dustpan to quickly clean up the dirt that is tracked in. You will be surprised at the amount of dirt that finds its way into the tent each day. A quick clean once a day can keep that dirt under check. Whether you need to make a clothesline, hang food in the air at night, or whatever else, extra rope is a great item to bring along. We always find a use for it and are always glad we brought it with us. If you have an infant or young toddler, consider bringing a pack and play. A pack n play is a great place to have your infants sleep at night. Similarly, you can bring it out during the day, which gives you a place to play them down while you need to do other things. Keeping infants and toddlers warm at night can be challenging because they don’t stay under blankets or in sleeping bags. A great option is to find a bunting that is suited for the temperatures you will experience. Buntings are great because it is basically a wearable sleeping bag for infants and young children. We’ve use buntings on multiple occasions and they have worked great for our needs. Inevitably our kids end up getting sick at the most inopportune times. Being prepared for some of the more common ailments will go a long way. We always bring extra medicine for the kids. Medicine for colds, headaches, coughs, diarrhea, and upset stomach are the most common medicines we bring. All kids get dirty but young children tend to get the dirtiest. They end up rolling around in the dirt and in some cases even trying to eat it. Keeping them reasonably clean can be a challenge. An easy solution for bathing is to simply bring along a plastic storage bin as a makeshift bathtub. It is portable, light, and inexpensive. Debbie, glad you like them. I hope they help you get your family out camping. Don’t forget the Band-Aids, first aid antibiotic ointment and hydrogen peroxide as there most likely will be some cuts and scrapes! My daughter fell off her bike when she slid in the gravel on the blacktop road while we were camping years ago and cut her knee pretty badly. Thankful that I had these first aid items in the camper!!! Great advice Patty! You definitely don’t want to have an injury while out camping and not have any way to take care of it. Thanks so much!! These are some great tips. No problem. I hope they help your family.